Okay guys, let’s talk … cast or troll, which is your flavor? This is an option that all fishermen are faced with and most of the time it is one that is left up to personal preference or, as I call it, “attitude” toward the different techniques. I enjoy them both but I have run into pretty strong opinions on both ends. The bottom line is there is an effective way to do both and they both are crucial to becoming a well-rounded fisherman. Gregg Thomas’ client, Gerry Wakolbinger, holds a nice Cave Run musky for a photo. Let’s look at the current time of year. Depending on where you are in musky country, it is early to late spring. In areas of the South, if weed growth exists, it’s likely three to five feet tall while in the northern range it is only a couple of feet high. Shad are spawning in the shallows of southern reservoirs where they find warm water, regardless if the bottom contains weeds, sand, gravel or muck. But on most lakes shallow weeds are the key to catch muskies in the early season. When fishing any large, weed-covered flat, you have to decide whether casting or trolling is the best way to attack it. In my opinion, if you are faced with a large weedbed and there is some distance from the surface to the top of the weeds, my time is usually best spent covering water with a trolling presentation. I like to really pay attention to my graph as I go over an area and I watch closely for anything that stands out. I constantly look for turns in the weed line, areas of thicker weeds or deeper sections of weeds, and I mark them accordingly. These little things are incredibly important when trolling and if you are not making note of them and you are one of those “trolling is boring” type of guys … well, you might want to start. Use your electronics to the fullest. This is a great way to learn what a spot truly has to offer. It is also good reconnaissance for casting the area later if trolling doesn’t work. You always have to be looking for clues to see where the fish may be positioned. In the spring, muskies will use two basic areas — one is large flats that reach some distance from shore, and the second is a shoreline that extends out a short distance. Whether they have weeds or not is irrelevant but for this piece let’s say they have weeds. Both require different trolling and casting setups and I will attempt to explain them both. Let’s start with a large flat and a planer board set-up. When trolling a large flat, I consider how many lines per angler we’re allowed to use. If I was running four lines I would have two lines off planer boards, and two “boat” rods. On the board lines I would have some type of shallow-diving lure, typically of a smaller size, because I have had better luck on them for all sizes of muskies in the spring. Smaller baits also match the forage better. With that said I have had my best luck on smaller baits like 5 1/2-inch Wileys, Shalya Shads and a new crankbait I am helping Musky Train develop, the 4-inch GT Bullet Minnow. These lures do not dive that deep so you can place them 20 to 30 feet behind the boards and they will only be running 3 to 5 feet down, making them perfect to comb over the new weed growth. On my boat rods (which are positioned next to the boat) I typically use deeper-diving crankbaits like Tuff Shads, Li’l Ernies and Baby DepthRaiders, which run very well on a short line. If run with less than 10 feet of line out, these baits allow great control and will stay just above the weed tops. If the law allows six lines or more you can add two extra boat rods or two extra planer board rods — the decision is up to you and the fish. Extra boat rods allow better control of your baits, but on some days fish will be spooked by the boat so you’ll want to use extra planer board rods. Check your planer board lines often for weeds because the rod tips will not wiggle with the lures’ action as they will on the boat rods. The planer board and indirect line angle will absorb the lure’s motion. It is very important to experiment to determine how far back you can run your baits before they become tangled in the weeds. My set-up would be different if I were trolling a shoreline that has a weedline or a small flat that extends out a short distance. In these cases, I would use only a boat rod set-up because the target area is a lot smaller and the I want my lures to run tighter to the structure. I also want more lures running in a smaller area, which I feel ups my odds of effectively covering the water. My basic set-up for four rods would be two out-lines and two down-rods. The out-lines take the place of the planer board rods and have shallower-running lures on them, which will stay higher in the water column with more line out than the deeper-diving shad baits. On my down-rods I will attach some type of deep-diving bait that I will keep close to the boat to control the depth and movement. It will also help with spacing and lure placement. To help in this process I will place the rod tips in the water. I will change things up slightly if I add another pair of rods for a six-rod set. I will place my down-rods closest to the bow of the boat followed by my out-rods and then run a set of propwash rods out the back, angled back toward the motor. This way the rods are angled so the lures are not running into each other. My shortest lines and rods will be my down-rods angled in the water and having less than 10 feet of line out. The out-rods will be longest rods (most of the time) positioned with the tips out of the water and the longest lines in the set. I will place the tips in the water if there is a lot of floating debris to keep the lines clean. The prop-rods will have their tips placed in the water. These are mainly short lines with the deeper-diving shad baits on them to keep them close and in control. A final thought on trolling — I am a big believer in mounting my rod holders on rails which allow me to manipulate the rod angle at a moment’s notice. With other set-ups you have to loosen a screw or pull out a chock to change the angle. With rail-mounted rod holders you need only to pull up or push down on the rod handle to change the rod’s angle, which is critical in lure control and placement. For example, if you are trolling a weedline and troll too close to the edge, a stationary rod holder will cause the lures to bury in the weeds. On rails, you can push down on the handle, causing the bait to shoot up and hopefully miss the potential hang-up. There are times in the spring when muskies do not want the straight-retrieve presentation that you’ll get from trolling, so casting becomes the best approach. 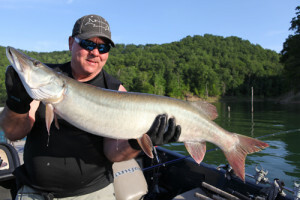 Typically the muskies are not real active at this time, so you need to trigger them to bite. I usually try to do one of two things when casting to shallow flats in spring — cast a stop-and-go style bait and make contact with the weeds or structure. Whether it is a jerkbait, jig or twitchbait I look for some type of trigger that I cannot get from a trolling presentation. If there are weeds on the spot, at some point I want my lure hitting them … now, this means picking a lot of vegetation off your bait but it is part of the presentation. Soft plastics like Red October Tubes, Medussas, Live Action Lures and Bull Dawgs have been great producers in these situations. If I am fishing a sand or gravel area I want my lures to make bottom contact. In these situations I will choose some type of buoyant crankbaits, one that will make contact with the structure but still float up. It is here that I will use some of the shad baits that we discussed earlier, like Li’l Ernies, Tuff Shads and Baby DepthRaiders. No matter what, the first goal while casting is to make contact with what you are fishing. If that doesn’t work try a varied retrieve with some kind of stop-and-go bait. Some days the fish just have to be triggered. The only time I will use a straight-retrieve lure is if I am want to cast super-shallow or if the muskies are positioned right on the shoreline and I can’t get a trolled bait to them. This can happen if the weeds are particularly thick in the shallows or the fish are relating extremely close to shore. Anyway, this is an option. Whether you enjoy casting or trolling it is important to realize that both are great techniques and they need to be used at certain times of year. Look at the structure you are trying to fish and make your decisions accordingly. You will cover the water more effectively and offer yourself a better shot at catching more muskies. Field Editor and tournament pro Gregg Thomas guides in Kentucky during the spring and in Minnesota during the summer and fall. For more about Gregg, visit www.greggthomasoutdoors.com.